^ Greene & Pole 1992, p. 393 James H. Merrell, "Indians and the New Republic"
^ "shot heard 'round the world"
^ Arthur S. Lefkowitz, "The Long Retreat: The Calamitous American Defense of New Jersey 1776[リンク切れ], 1998. Retrieved September 10, 2007. 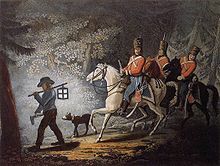 ^ Number of British troops still in America: Piers Mackesy, The War for America: 1775-1783, p. 435. ^ Smallpox epidemic: Elizabeth Anne Fenn, Pox Americana: The Great Smallpox Epidemic of 1775-82, p. 275. A great number of these smallpox deaths occurred outside the theater of war?in Mexico or among Native Americans west of the Mississippi River. Washington and inoculation: Ellis, His Excellency: George Washington, p. 87. ^ American dead and wounded: John Shy, A People Numerous and Armed, pp. 249?50. The lower fihure for number of wounded comes from Chambers, p. 849. ^ British seamen: Mackesy, p. 6, 176. ^ Black, p. 39; Don Higginbotham, "The War for Independence, to Saratoga", in The Blackwell Encyclopedia of the American Revolution, p. 298, 306. ^ Higginbotham, p. 298, 306; Black, p. 29, 42. ^ Harsh methods: Black, pp. 14–16; slaves and Indians: Black, p. 35, 38. Neutrals into Revolutionaries: Black, p. 16. Greene, Jack P.; Pole, J.R. (1992), Blackwell Encyclopedia of the American Revolution, Wiley;, ISBN 1557862443 Collection of essays focused on political and social history. Higginbotham, Don (1971), The War of American Independence: Military Attitudes, Policies, and Practice, 1763-1789, Macmillan Pub Co, ISBN 0025514601 Northeastern University Press, 1983. ISBN 0-930350-44-8. Overview of military topics; online in ACLS History E-book Project. Kaplan, Sidney (1974), Black Presence in the Era of the American Revolution, New York Graphic Society, ISBN 0821205412 Amherst, Massachusetts: The University of Massachusetts Press, 1989. ISBN 0-87023-663-6. Shy, John (1976), People Numerous and Armed: Reflections on the Military Struggle for American Independence, Oxford University Press, ISBN 019502012X revised University of Michigan Press, 1990 (ISBN 0-472-06431-2). Collection of essays.